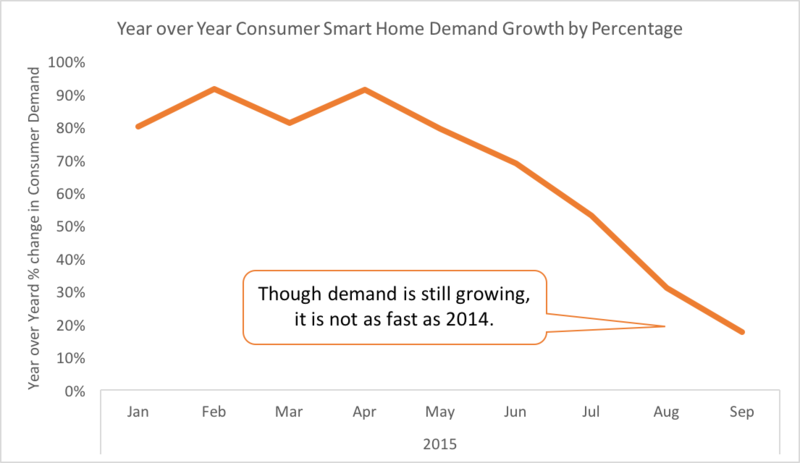 We’ve had some bold claims with regard to the Smart Home market this year. Our June analysis showed a significant drop in consumer demand for DIY equipment, mostly driven by a fall off in security cameras. Our refreshed analysis in August saw delight increase as demand slowed, a further indication that the main stream market might be leaving DIY Smart Home to the early adopters. Along the way, we have added new sources and new products to further expand our coverage. As a result, we are delighted to share the revised results of our analysis of Consumer Smart Home demand through September 2015. While the overall demand has increased, the same slowing trend we reported on in June and August persists, with September at the lowest level of any month this year. Where is the growth coming from? The rebranded Ring and other entry control brands have had significant gains this year while the novelty of smart light bulbs is starting to wear off. Even the darling that drove most of 2014, the humble security camera, has had only single digit demand growth for August and September. What does this mean? DIY Consumers are expanding from their first purchases of Thermostats and Cameras into other equipment to drive up their abode IQ. Though smart lighting has some the highest delight scores in our tracking of consumers, overall interest is falling as consumers are shifting from easy to install novelty products to more complex integrations. Will the momentum of 2015 continue into 2016? Argus Insights will be at the Consumer Electronics Show in force, following soon after with our predictions for 2016. Let us know if you’d like to catch up in Vegas!